Connor Hellebuyck made 28 saves, and Nikolaj Ehlers and Kyle Connor scored for the Winnipeg Jets in a 2-1 win over the Minnesota Wild on Tuesday. Winnipeg Jets goaltender Connor Hellebuyck found a new trainer to work with in the off-season to continue his development. Hellebuyck's work with the trainer, who also trains Minnesota Wild goaltender Devan Dubnyk, is paying off for Winnipeg. Hellebuyck made 28 saves, and Nikolaj Ehlers and Kyle Connor scored for the Jets in a 2-1 win over Minnesota on Tuesday. "Not that I ever didn't work hard, but I really figured out my game and was able to replicate it," Hellebuyck said. "Now I know exactly what I'm doing every night." Rookie Luke Kunin scored his second goal of the season and goaltender Alex Stalock stopped 17 shots for the Wild, who had won two in a row and three of their previous four games. "I think on the power play, it may sound difficult, and it may not go in, but you need five guys thinking as one," Wild coach Bruce Boudreau said. "And I think right now, we've got five guys thinking as five guys. And so nobody can read what you're supposed to be doing. And we do have, there's a plan in place, and we've got to get the guys to just do the plan." 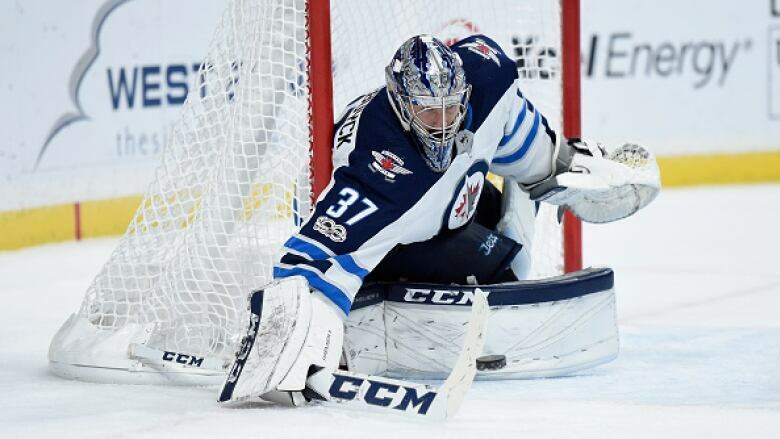 Hellebuyck continued his strong run in net for the Jets, who had made the move to acquire Steve Mason as the starting netminder in the off-season. While Mason has a 4.84 goals-against average and .872 save percentage in his four games, Hellebuyck's numbers rank among the league's best. He entered the game sixth in the NHL in save percentage (.937). Hellebuyck (6-0-1) is the only goaltender in the NHL who has made at least five starts and is undefeated in regulation. "I think the big games bring out the best in him and he's playing with a lot of confidence right now," Jets forward Blake Wheeler said. "We're trying to do a good job in front of him, letting him see pucks, and he's making some big saves so that keeps you in games." Connor opened the scoring 7:10 into the first. Mark Scheifele tipped defenceman Tyler Myers' shot from the point and the puck fell right to Connor. The line of Connor, Scheifele and Blake Wheeler have accounted for five goals in the past two games. Ehlers took advantage of a mistake by Minnesota defenceman Matt Dumba in the third. Dumba tried a drop pass in the defensive zone to Mikael Granlund, but Ehlers was between them and quickly collected the loose puck, skated past Granlund and scored for a 2-0 lead. "I was kind of looking to see what he was going to do," Ehlers said. "I saw he looked back at Granlund and I was hoping he was going to drop that puck." Dumba was benched by Boudreau after the turnover. "I know that was my fault tonight. I've just got to man up and own it and try to move on," Dumba said. "It's frustrating, and you know you let your teammates down like that on a play that I can routinely make. It's like an interception, like a pick-6, like the guy runs it back to the house."